Sleeps 2-4, Living room, bedroom, Shower Room, Kitchen, Free WiFi, TV DVD. A superb quiet one bedroom lower ground floor apartment with natural light that looks onto a well kept court-yard garden. Facilities include a fully fitted bathroom and kitchen including dishwasher, fridge/freezer, washing/dryer machine and separate living room with sofa bed, free WiFi internet access, TV/DVD, Hi Fi/CD/iPod Player and dining table. The apartment is ideally situated for Olympia Exhibition Centre, as well as the District and Piccadilly Tube Lines (with its all night weekend service), Kensington Olympia rail station and local bus services to all of London's many attractions and the West End only 15 minutes away. As well as the night bus service from Heathrow to Trafalgar Square. Also nearby is the Westfield Shopping Centre. Notes: There are six steps down to the front door of the apartment. Own private street access. Please read all of the rate information for the rates for more than two people. John and I enjoy travelling around the world and as such have been critical of many properties we have stayed in over the years. Hence we run our holiday let as we would expect others to run theirs. When we advertise no hidden extras we mean it. We also try and keep the booking and payment process as simple as possible - again with no hidden additional charges. Our apartment is in a quiet tree lined street in West Kensington and is surprisingly quiet considering its location. It is ideal for visiting all of the London sites which are only 15 minutes away by the underground/metro system. Father and son celebrating 13th birthday spent eight days at Ian and John’s perfect location. Near cafes, shops, two tube stations, made for ease in sightseeing London and beyond. Clean, comfortable accommodations and a washer dryer that made our packing lighter. In a great, quiet neighborhood where we rented bicycles to explore. Definitely highly recommended. Jim and Jack NYC. Close to two tube stops. Very conveniently located for access to Heathrow, and Olympia. Quiet, spotless, comfy bed, and well-priced. My wife and I recently had a great stay at John and Ian's apartment and hope to return soon! The apartment is located in a very safe and quiet area very close to a tube stop as well as great dining and shopping options. John and Ian were very welcoming and the apartment was immaculately clean, very well appointed and has everything needed to facilitate a great visit! Thank you for your kind hospitality - we hope to see you again soon! Great hosts, convenient location, all the amenities of home. We could not have been more pleased with the apartment. We spent 6 nights, feeling welcome and at home right away. Ian and Jon provide so many resources to help with planning time in London and England. This was a very hassle free stay for us from arrival to departure. We hope to return. 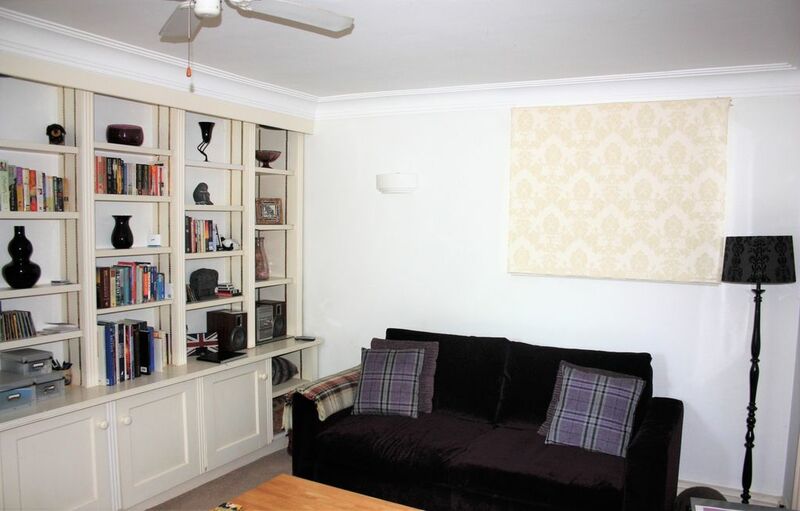 Sweet and cozy, quiet, a lovely neighborhood with close proximity to the tube station. The property is well-equipped with the necessary kitchen items as well as towels, guide books and information about London. The shower works well, and there is plenty of hot water. The property is a little rundown; the carpeting is a little stained in places and there is mold on some walls and in the bathroom. Despite these comments, I would choose to stay here again. Thank you for your feedback. The apartment is being repainted this winter. The carpets are less than 18 months old and we are unaware of any stains. Terrific flat, great location, wonderful hosts! Ian and John’s flat is lovely and very well appointed, and in a great location. The kitchen had everything we needed for our 5-night stay, including enough dishes for when our son and his family visited during the day, a full-sized dishwasher and washing machine. The home had way more electrical outlets than any other flat we’ve ever rented in London – very helpful with recharging all of our gadgets! Ian was right next door, and available to answer questions. Very comfortable bed, great shower, nice areas for relaxing between outings, easy access to nearby neighborhood shops and underground stops for trips to central London and elsewhere. We’ll definitely look to book again here for a future London trip! West Kensington, Hammersmith and Fulham, Central London. Close to Olympia and Earls Court Exhibition Centres, Queens Tennis Club and Westfields Shopping Centre. A few minutes walk to either Barons Court (Piccadilly line) or West Kensington (District line) Tube stations and easy access to all London's attractions: Knightsbridge, Harrods, Hyde Park, Buckingham Palace, Westminster, Sloane Square, West End Theatres, Oxford Street. Walking distance to Kensington High St, Holland Park and Thames River Path.